We offer repair and installation of full view glass overhead doors in the metro Atlanta, GA area. We offer competitive rates and solid warranties on all of our repairs and installs. Contact us at 678-714-7393, or online, for more information on our glass door repairs and installations. We also service other types of commercial doors. 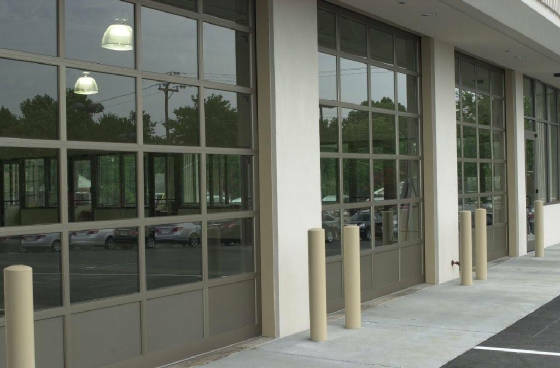 We repair all types of full view, or glass, overhead type doors in the Atlanta area. Commonly found as service bay doors, or even in restaurants, these flashy doors tend to be in a customer facing application. We understand the need to have them operating safely at all times. Same day repairs are available in many cases, and we make every effort to get your door up and running as quickly as possible. Offering many different brands and models of glass, or full view doors, we can help decide which is right for you and your budget. Typically constructed using aluminum, these doors come in a wide variety of colors for the rails and stiles, and have the added option of using some solid, insulated aluminum panels. Contact us for more information on having a glass full-view door installed in the Atlanta, GA area.